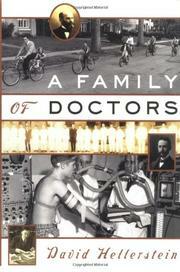  An artful blend of medical history and family memoir. Psychiatrist and writer Hellerstein (Beth Israel Hospital/New York; Battles of Life and Death, 1986; Loving Touches, 1987) traces his family's links with medicine through five generations, beginning with his great-great-grandfather's brother, Marcus Rossenwasser, whose parents sent him from Cleveland back to Prague for his medical education and who practiced in Cleveland from the 1870's to 1910. One of Hellerstein's resources here was a remarkable and revealing log titled ``Obstetric Notes'' that Rossenwasser kept from 1875 to 1893. In the next generation, Hellerstein's maternal grandfather's stepfather (there's a neatly done family tree that sorts all this out), Gustave Feil, was a physician in Denver, although Hellerstein is unable to discover much about him except that he had tuberculosis and killed himself in early middle age. Next, the author traces the career of his maternal grandfather, Harold Feil, a cardiologist who exemplified a new trend in medicine by becoming a clinician-scientist--that is, combining private practice with teaching and research. Hellerstein's father took the trend a step further, becoming a full-time faculty member at Western Reserve, deeply involved in cardiology research. If there is one dominant figure in this book it is he, and there are wonderful scenes of him dragging his children around the hospital with him. Hellerstein's mother, also a physician, unfortunately remains a shadowy figure, perhaps because her doctoring was so often interrupted by mothering. In the current generation, four of the six Hellerstein offspring are physicians--a psychiatrist, a urologist, a pediatrician, and an obstetrician. Hellerstein does a fine job of contrasting the cultural with the medical milieu of each generation, and his descriptions of each period's dilemmas and opportunities indicate not only what medicine has gained but what it has lost in the past century. Rewarding reading--and a good gift for the would-be medical student.